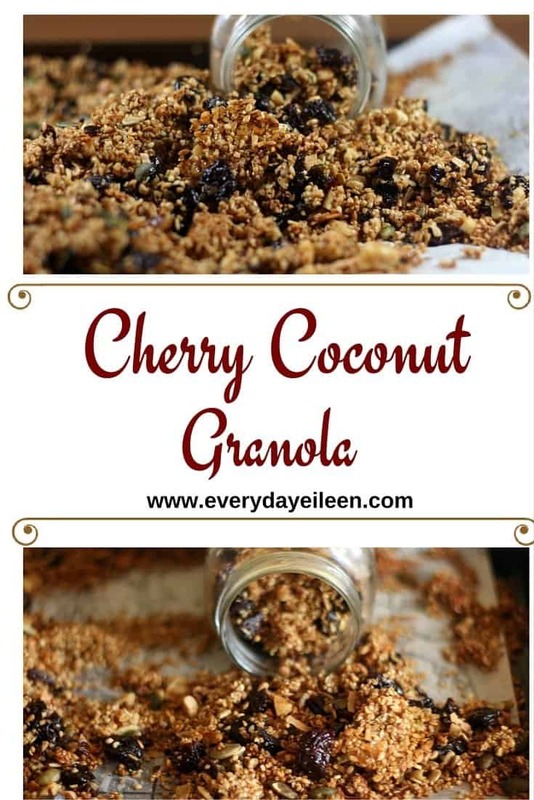 Cherry Coconut Granola is a delicious and easy recipe to prepare! Homemade granola is a also easy on the wallet and you can vary your ingredients to your favorite flavors! Welcome to 2016, albeit a little late for me! I hope everyone is having a great year so far! I have had an interesting few days! Half my family had the flu and we are down to my youngest having a respiratory infection and hoping she will be feeling better tomorrow! I have to share that you should be glad this is not YouTube because currently I am on a 24 hour EEG monitor. You are probably wondering what the heck and why? Yup, me too! If you were not aware, I had a stroke 2 years ago, so this is part of the resolution process for my doctor. Currently, I am wired up to probes on my head that are connected to a monitor until tomorrow! I look ridiculous! Well, enough of that now let’s get on to a happy and healthy 2016! I certainly hope this is it for the year and we are on an upswing! Have you made a New Year Resolution? I am hoping to be more organized! I have had my blog for just a few months and I want to thank everyone! I honestly am so thrilled to have made many new friends and I can’t believe that in 5 months I have been so fortunate to have quadrupled my viewers. I know I still have a long way to go and so much to learn, but looking forward to the ride! I want to bring more recipes and some fun things to everyone! So here it is, a wee bit late, but my first recipe of 2016. If you haven’t guessed already, it is Cherry Coconut Granola! I am not kidding, you will never buy an expensive box of granola again! Really, no joke, it is so easy and addicting and guess what, it is not full of extra preservatives and words with lots of vowels that I have no idea what they mean except that they can’t be good for anyone’s body! What I love with any homemade granola is the versatility! I recommend a few cooking tips based on many batches of granola! Finally, experiment with different oats, grains, nuts, fruits, and sweeteners – quinoa, chia seeds, pepitas, pecans, walnuts, coconut oil, you get the idea! Well, now that I have gotten all my opinions out, I hope you love this recipe! Have your granola with almond milk, yogurt parfait, as a mid-morning snack, any way you like your granola! I bet you will become a homemade granola connoisseur after this batch. I would love to hear your combinations, keep me informed people! I hope you like this recipe as much as my family, and if so, please share the love on Facebook, Pinterest, or your favorite way of relating to your friends and family, and please continue connecting with me on Instagram, Pinterest, Twitter, Bloglovin, Google Plus ! Feel free to subscribe to my newsletter to never miss a recipe! Homemade granola made with dried cherries, shredded unsweetened coconut, pepitas, hemp seeds, sunflower seeds and other deliciously healthy sweeteners and grains. Great for breakfast with Almond Milk, a topping for a yogurt parfait, or as a snack! You will never buy a store bought box of granola again! Toss the steel-cut oats, shredded unsweetened coconut, hemp seeds, flax seeds, sunflower seeds, unsalted pepitas, chopped walnuts, turbinado sugar, cinnamon and nutmeg together. In a separate bowl, combine the raw honey, coconut oil. ( Make sure the coconut oil is liquified - if solid, either microwave or heat in a pot on the stove to liquify), and vanilla extract. 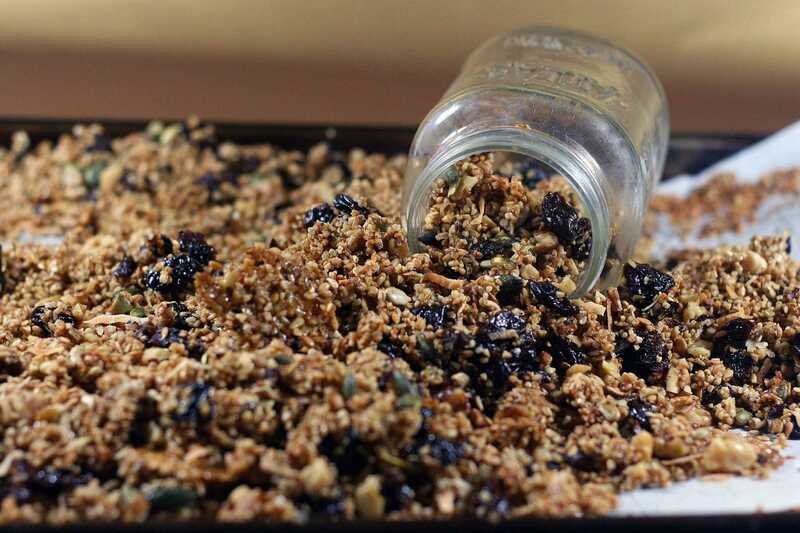 Combine the wet ingredients into the dried granola mix and blend well. Line a cookie sheet with parchment paper and add the blended granola mixture to the cookie sheet. We think your weblog is much powerfull to us! I have hope that you keep up the pretty work. Will you please visit my website also? This recipe has a lot of what I love in it – granola is one of my favorite snacks and ingredients. You use turbinado sugar often – is there a particular reason? Is there anything you would substitute? Elizabeth, I do like turbinado better than regular white sugar because I find I can use less because it is flavorful, its really just me preference. Turbinado is also non-gmo and gluten free and my kids are really into eating healthy and they also prefer turbinado. To substitute turbinado, I would use light brown sugar because it has a similar texture. Thank you for asking and I hope you try and if you do substitute, let me know how the scones turn out for you! Ah, homemade granola is the best!! Great recipe! I love the combination of ingredients! I have been making my own granola for sometime. It is so much healthier than a lot of store bought brands! I’m not a granola for breakfast person but I’d use it to bake something sweet 🙂 Looks yummy! I started 2016 with granola too. Made it with goji berries. I agree with you that homemade granola is so much better! I would never have guessed making your own granola would be so simple. I have all these ingredients already so I will definitely be giving this a try! Thank you so very much Rebecca! I had no idea, great news! wow I am so looking forward to making this as I need a new snack since I have been eating clean for the past couple of months, this looks like it would be something in line with what I am eating. 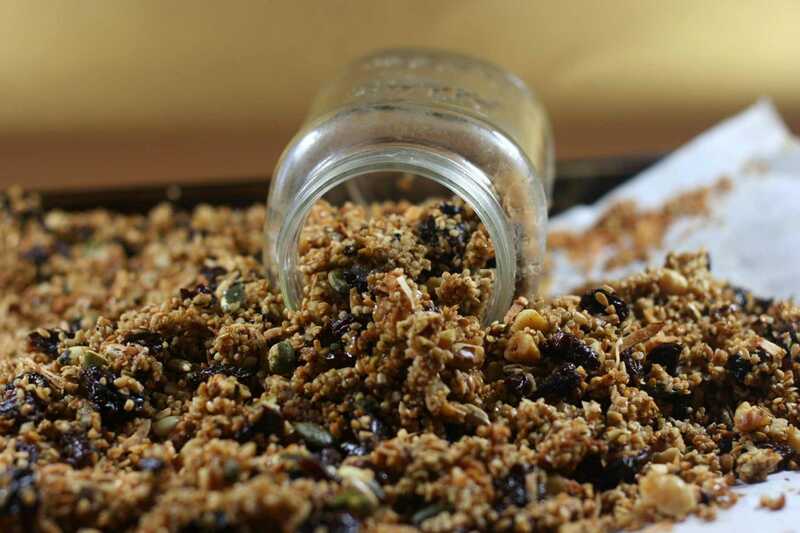 This granola would be a perfect addition to your clean eating regime! Here’s to better health for you and your family in 2016! I’m pretty much a granola addict. I love it all day long with yogurt and maple syrup! Your recipe sounds like a winner for sure! I love making homemade snacks like this. Not only do you save money, but you get to make the flavor combinations that you really want to eat. ABsolutely, that is the beauty of granola – you can adjust anything to your liking! I’ve been trying to add more granola to my diet. I’m pinning this for later! This would be perfect over some plain yogurt and some fresh fruits! Perfect for snacking too! 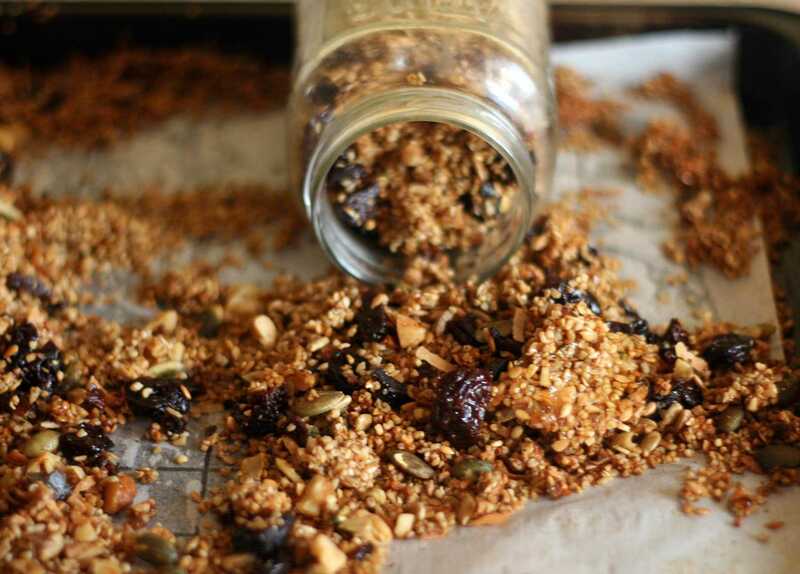 I have been wanting to try granola and this recipe looks awesome! That looks healthy and yummy. I can’t wait to try this. This sounds so amazing! 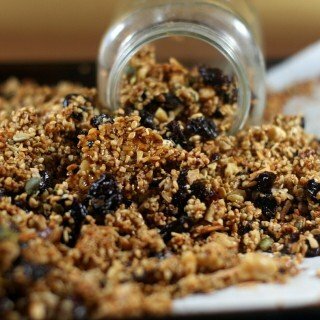 I have always wanted to make homemade granola and I love the way your sounds! Great Margaret, I hope you enjoy the snack! I love homemade granola! Cherry Coconut sounds amazing!! And my family has all been sick too. I’m just now getting over it and haven’t even posted this year yet. Hopefully, I’ll get one up tomorrow! Hope you all feel better! Jenn, I hope you and your family feel better soon. I feel the pain, it was a tough week. If not tomorrow, don’t worry, you have all year to give us wonderful posts! I’ve never had homemade granola. This looks amazing and I bet it’s great added to yogurt as well. I love homemade granola, they are so healthy and you can customize it as per choice. This looks super delicious and I love that you added so many healthy seeds. This is a perfect combination in granola. I like that you added a pinch of salt to it too. Thank you Liz, I agree, Granola always needs a little salt! I recently tried granola cereal and loved it. Me and my mom have been wanting to make granola from scratch. Can’t wait to try this recipe out! I hope you and your Mom enjoy. 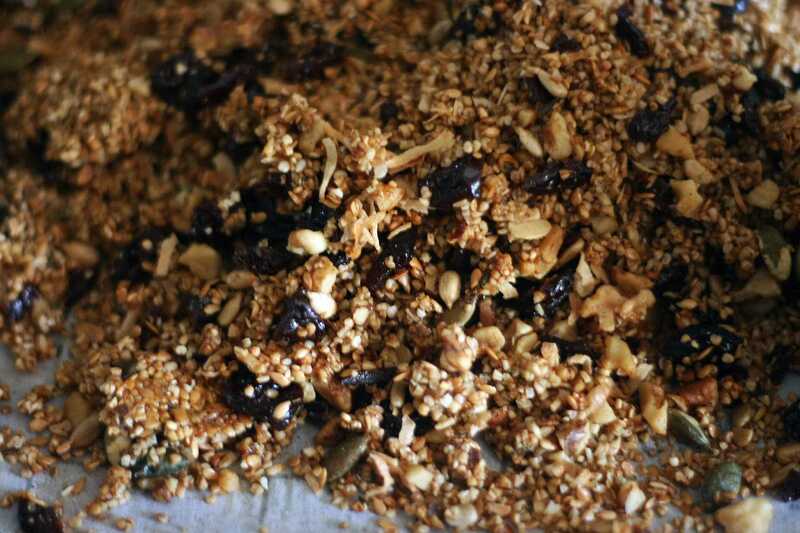 This is a great recipe to start with making granola! Yum! I love granola. Yours sure looks good too! This looks like a delicious granola recipe. I will have to make some up and give it a try. That sounds great, I hope you enjoy! Added this recipe to my YumPrint cookbook. Can’t wait to try it out. Could you substitute cranberries for the cherries? Blythe, absolutely, cranberries would be absolutely delicious! This granola looks and sounds so tasty. I love cherry and coconut, so the combo sounds awesome. I really love granola. It is so healthy and delicious. Can’t wait to try your recipe! Let me know how it worked for you! Enjoy! I hope so, its a good one! i’m not into granola but my dad loves anything cherry. I hope your Dad enjoys! Thank you so much for your kind words, Mardene! My mom would love it, she always making this before and it’s so fantastic. This sounds amazing I love granola for breakfast and snacks. I love homemade granola! This sounds super tasty! Oh! This is really nice with greek yogurt or overnight oats! Definitely something I’ll do for my quick go-to snacks! I’ve never tried it, looks so nice. I’m going to try this. Great, any type of granola is always a good one, I love this one in particular! My mom would surely love this recipe. I need to bookmark this and see it to her. I hope your Mom enjoys the recipe!